Constance Williams Rice became one of the most influential women in Seattle in the late twentieth century and remains so well into the 21st century. She was born to the union of a subway motorman, Elliott Williams, and Beulah Marshall Williams on June 23, 1945 in Brooklyn, New York. 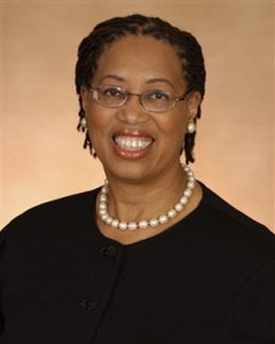 Rice received her primary and secondary education in the New York public schools and graduated from Queens College in 1966. In 1967, she moved to Seattle and briefly married. When the marriage did not survive, she enrolled in the University of Washington’s College of Education, received a master’s degree in education, and later became the first African American woman to obtain a doctorate degree in higher education administration in 1974. It was while teaching a college course that she met community activist, Norm Rice, who would later become the first elected African American mayor of Seattle in 1989. They married in 1975 at Mt. Zion Baptist Church in a ceremony officiated by Rev. Dr. Samuel Berry McKinney. Rice held many leadership positions in education and in business throughout the 1980s and 1990s. She became Chair of the Ethnic Studies Department at Shoreline Community College, Assistant Executive Director for the Washington Education Association, and Director for Western Washington University’s Center for Urban Studies in Seattle. Rice managed communications for Metro, the local transit authority, and, in 1984, started her own business, CWR Public Relations, which became one of the first African American-owned public relations and management consulting firms. Rice also sought to provide a space and forum for black women professionals across the city to organize. In 1984, she founded 101 Black Women to provide a region-wide network for black women who often felt isolated in predominately white workplaces and in the city of Seattle. The organization, which would eventually have more than 200 members, fostered professional networks for black women where they could forge friendships in Seattle and find job opportunities. Unlike similar organizations in other cities which limited their membership to professional women, 101 Black Women included individuals of varied income levels, newcomers, longtime Seattle residents, young and old, married and unmarried, professionals, and homemakers. Rice and her husband gained notoriety throughout the city in the 1980s as staunch political, business, and education advocates. When her husband ran successfully for mayor in 1989, she closed her business to work with him full-time as a volunteer on his campaign. That same year Washington Governor Booth Gardner appointed her a trustee of The Evergreen State College in Olympia. In 1992, Rice was appointed Vice Chancellor for Seattle Community College, and the following year, the King County Association of Realtors recognized her as Seattle’s First Citizen. In 2000, she helped found the Desmond Tutu Peace Foundation in Cape Town, South Africa. She also helped establish the Strategic Education Center which builds, funds, and operates schools in Swaziland and provides educational and health resources for adolescents to reduce the spread of HIV/AIDS. Rice is affiliated with numerous organizations and volunteers her time to many Seattle programs which include the Greater Seattle Chapter of the Links Incorporated, the Fred Hutchinson Center, Service to Youth, and the Benefits Guild Organization, founded by Rice’s mentor and Seattle’s civil rights activist, Freddie Mae Gautier. Constance Rice currently resides with her husband in Seattle and is the Managing Director for Prevention and Family Support for the Casey Family Foundation. David Wilma, “Constance Williams Rice,” HistoryLink.org, Jan. 1, 2005, http://www.historylink.org/index.cfm?DisplayPage=output.cfm&file_id=7185; Marla Williams, “Constance Rice Pursues Her Own Agenda,” The Seattle Times, July 12, 1992, p. 8; Susan Gilmore, “Group Helps Black Women in Careers-Social Organization Grew Quickly At Its Start, Now Has Many Roles,” Seattle Times, May 31, 1990, p. F2. Roles,” Seattle Times, May 31, 1990, p. F2.